Jaydon Mickens signed with the Jaguars practice squad in September. 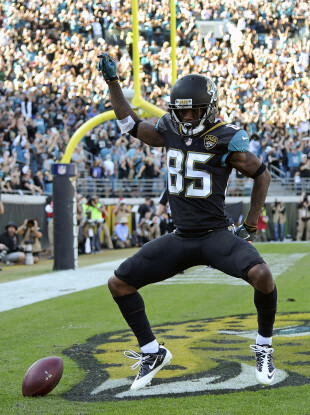 Jacksonville Jaguars wide receiver Jaydon Mickens (85) celebrates. ONE OF THE breakout players on the breakout Jacksonville Jaguars squad went to extremes to protect his uncertain future. According to Phillip Heilman of Jacksonville.com, when Jaydon Mickens signed with the Jaguars practice squad in September after being cut by the Oakland Raiders weeks prior, he decided to live out of his car. Mickens was unsure how long he’d be in Jacksonville and wanted to save money instead of paying for temporary housing. According to Heilman, Mickens estimated that he made about $6,500 in weekly cheques while on the practice squad and he wanted to save that money in case he needed it later on. He and teammate Larry Pinkard both would get in their cars at the end of the day and find a place to park and sleep — sometimes the Jaguars’ EverBank Stadium or a hotel parking lot. The next day they would go to the facilities to go in the hot or cold tub and get breakfast before team meetings and practice. He never told teammates or staff about his living situation so as not to be a distraction. Mickens was promoted to the full-time squad in Week 7 and now makes the rookie minimum of about $465,000. The promotion has paid off for the Jaguars — Mickens has served as one of the best punt returners in the NFL. He has one touchdown on the year and his 13.1 yard average return is second best in the NFL. In the Jagaurs’ Week 15 win over the Houston Texans, Mickens also caught five passes for 72 yards and two touchdowns. According to Heilman, Mickens and Pinkard bought a townhouse in Jacksonville and are no longer living out of their cars. With the spark he’s provided for the 10-4 Jaguars, Mickens clearly plans to be around for a while. Email “NFL player was cut 3 times in a year and lived out of his car for months before becoming a star”. Feedback on “NFL player was cut 3 times in a year and lived out of his car for months before becoming a star”.